So, about six years ago this guy Vallebuona made a Mario PWAD for Doom. Well, kind of. I don't think he ever finished it. But it got me thinking I could make a real Mario PWAD myself. And so I started this project around June 2011, using SLumpEd to replace Doom's graphics, sound and music with ones ripped from Mario games. The reason it took so long is I kind of got bored/lazy after about a month-and-a-half (editing, adding and configuring over a thousand sprites can take the wind out of you) and stopped working on the WAD for almost a year, until late July this year when I decided to jump back into it. Then the same thing happened again and I didn't work on it between mid-August and mid-November. Finally, realizing most of the hard work was out of the way, I decided to power through that last stretch, and now today on December 1st, I can share the fruits of my labor: Super Mario Doom v1.0. I'll start things off by listing the changes. First off, the Space Marine has been replaced with Mario. Who else? Health Bonuses are now Mushrooms. Stimpacks and Medkits are now Super Mushrooms and Ultra Mushrooms, respectively. The Supercharge is now a 1-up Mushroom. Armor Bonuses are now Coins. Armor is now replaced with a Green Koopa Shell, and Megaarmor is replaced with a Red Koopa Shell. Keycards and Skull Keys are replaced with regular ol' Keys. Exploding Barrels are now Bob-ombs. Some of the items don't make a lot of sense (like the ? Ball and the Potion), but I had a hard time thinking of what Mario series items I could use for those. Your Fists are now... well, they're still Fists. But they're Mario's fists. The Chainsaw is now your very own Chain Chomp. Give your enemies a taste of their own medicine and chew them up! The Pistol is now a NES Zapper, and the Chaingun is now a Super Scope. Ammo Clips have been replaced with Batteries. The Shotgun is now a Piranha Plant, and the Super Shotgun is now a Super Piranha Plant. Shotgun Shells are now Watermelons. You feed the Piranha Plants watermelons, and they spit the seeds out like buckshot. Yeah. The Rocket Launcher is now a Bullet Bill Launcher. Rockets are now Bullet Bills, naturally. The Plasma Cannon is now a Magic Wand (the sort a Magikoopa would wield), and the BFG 9000 is now a Star Rod. Plasma Cells are now Crystals. Zombiemen are now Green Koopa Troopas, Shotgun Guys are now Red Koopa Troopas, Chaingunners are now Yellow Koopa Paratroopas, and Wolfenstein SS Guards are now Blue Koopa Troopas. They wield Zappers, Piranha Plants, Super Scopes, and Zappers respectively. Imps are now Shy Guys. Don't tell HotD. Demons are now Chain Chomps, sans the chain. Cacodemons are now Lakitus. They now throw Spiny Eggs instead of spitting lightning balls. Lost Souls are now Boos. Pain Elementals are now Big Boos. Revenants are now Dry Bones. They now throw bones instead of shooting missiles. Arachnotrons are now Mr. Is. Arch-viles are now Magikoopas. Makes sense, right? Instead of attacking you with fire, they attack you with geometric shapes. Hell Knights and Barons of Hell are now Hammer Bros.. The Knights are replaced with green-shelled Hammer Bros., while the Barons are replaced with black-shelled Army Hammer Bros. They throw hammers instead of fireballs. The Cyberdemon is now Bowser, naturally. The Spider Mastermind is now Petey Piranha. Commander Keen is now Toad. I know, not really an enemy. As for the final boss? You'll have to see for yourself. The graphics. Almost all of the sprites are modified rips. Most of the enemy sprites are taken from the Mario & Luigi games. There's some discrepancies in scaling; for example, most of the enemy sprites are upscaled 2x so they will more closely match the size of the original Doom enemies, but some enemies with larger sprites aren't upscaled at all (the Big Boo is enormous, but it was the best sprite set I could find to edit to face four different directions). The spritework isn't immaculate, but modifying existing sprites is way easier than making new ones from scratch. I will try to touch up the sprites in future versions (see below). The title screen, the weapons (not the weapon pickups, but the in-use graphics for the weapons), and the final boss were all drawn by me. I like how most of them turned out, but I will revisit a few of them in later versions as well. The violence. This mod is at least as violent as normal Doom. When starting this, I considered making it a bloodless mod, where enemies would more or less just fall over when you kill them. I decided against this for two reasons. The first is that it's just hilariously absurd watching Mario characters getting blown apart. The second is that it makes the death animations for the characters much easier to create. Most of the sprites I used don't have death animations or even falling over animations, and throwing a little blood splatter here or some chunks of flesh there helps mask the rough edges of my edits. In the case of the Magikoopa, there was no easy way for me to create an animation of it falling over backwards without drawing it from scratch, so I thought, "To heck with it, I'll make it explode into blood when it dies." I'll probably completely redo that animation when I have the time. The music. All of the music is taken from Mario games. I wanted to maintain some of Doom's dark atmosphere, so aside from the tracks for the menus and the first few levels of the game, most of the music comes from places such as Bowser's castles, ghost houses, fortresses, airships, dungeons, boss battles, etc. Versions. As you may notice on the title screen, this is Mario Doom v1.0. I'm super glad I'm actually able to release the WAD as it is, but I feel it could still use some more improvements. Maybe some sprites need to be tweaked. Maybe some sounds could be replaced. Maybe there are some objects or textures that I missed which could be replaced with Mario-themed graphics. To all you who will be playing with this WAD, here's where you come in. Any suggestions you may have, post them here so I can take a look at them. I appreciate any help at all towards making this WAD complete. Redo the Zapper graphics. Not enough of the gun is shown, and the angle doesn't match up with the other guns. The Piranha Plant weapons still use the regular shotgun sound effects. If I can find something else that will fit, I'll change it. Make the Big Piranha Plant's reloading animation a bit smoother. Redo the Big Boo sprites. It just needs to be smaller, that's all. Completely redo the Magikoopa death animation. It looks atrocious. As stated before, I had trouble finding Mario-themed analogues for a few of the items. If I can, I'd like to replace the sprites for the Computer Area Map, the Light Amplification Visor, the Partial Invisibility, and maybe the Backpack and the Berserk, with things that are a bit more fitting. Whomps and Mr. Is still use the Mancubus and Arachnotron projectiles. I'd like to replace them with sprites from the Mario games. It's not so bad for the Mr. Is (they shoot beams anyway), but I'm sure I can find something that will fit Whomps better than fireballs. Replace the ingame strings. For example, "You got the Chaingun!" would be replaced with "You got the Super Scope!" Touch up the Hammer Bro. alert/death sounds. I couldn't find any Hammer Bro.-specific sound effects on the web for some reason, so I recorded them myself from Super Mario 3D Land. If I can't find actual sound rips, I'd like to at least improve the quality of my own recordings. Replace some more of the game's sounds, particularly the environmental sounds. Probably the door SFX. Maybe the switch SFX? Possibly replace some or all of the textures with ones from Mario games. I'm not sure how good the game would look with all of the textures replaced, so we'll see how far I go. Maybe edit the palette a bit. Some of the sprites have odd coloration ingame due to the fact that not all of their colors appear in the standard Doom palette (which is primarily a slew of reds, browns and grays). For example, in some lighting part of the Magikoopa's cloak will appear gray rather than blue. Add alternate skins for multiplayer. Playing with a bunch of Marios is cool, but why not Luigi, or Peach, or Wario? If possible, I'd like to add extra sounds so they don't all sound like Mario, too. Perhaps at some point, move from a Mario-themed cosmetic patch to a full-blown Mario mod. 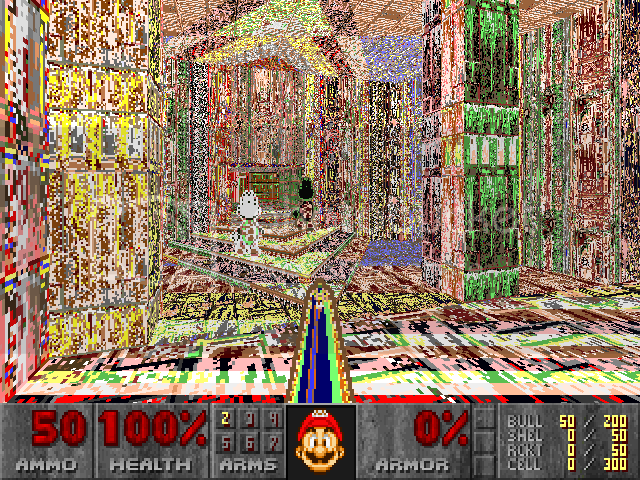 Create levels based in the Mushroom Kingdom, add jump mechanics, and make it more like a Mario/Doom hybrid than just Doom in Mario's skin. But that's all way in the future. We'll see how much of it I get done. I could always use some help, though. The download link. You can download the PWAD here (8MB). If the link is broken or you have any other problems downloading it, let me know and I will fix it ASAP. To play Doom using this WAD, you need a source port that will allow you to run Doom with PWADS. (I would recommend Zandronum, or its predecessor Skulltag. 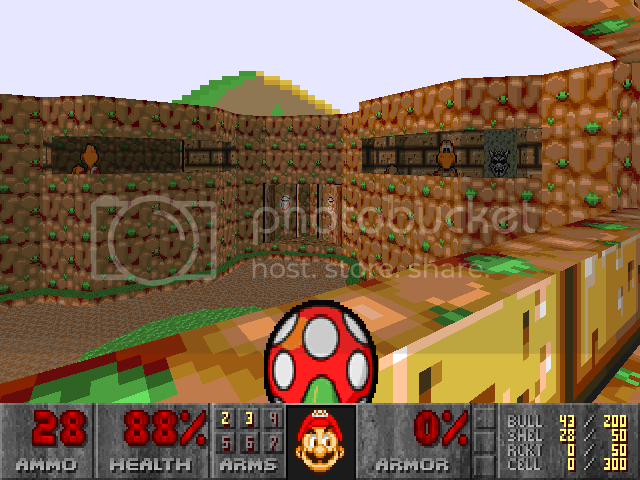 Select a Doom IWAD (Doom, Doom II, Plutonia, or TNT) and run it with MarioDoom.wad. And enjoy! Do the Dry Bones get back up? Even in fangames, Mario installments aren't safe from Petey Piranha's inclusion. Oh well, at least you get to blow him apart. Stellar mod there, man. It's always refreshing when big projects people put off from time to time actually get finished. Sounds really cool, Val. Congrats on finally finishing it. That looks like a pretty killer mod. It's very rare that someone who actually knows what he's doing graphically takes it on himself to do this kind of mod. Congrats on completing your first skin of Doom! The SMW stuff is pretty versatile, and to be honest much more tasteful than more recent games (heck of a lot less voice sampling to start) so if you need to replace repeating stuff, I'd definitely recommend looking to it. So, um, question: Did you ever replace stuff like the Cyber demon with princess peach sprites? Because her emitting that sort of deathly monstrous scream would be hilarious. I actually like this one a lot better than the other guy's Mario Doom. While I feel bad about blowing Shy Guys to bits, this is an awesome WAD. I burst out laughing after grabbing the Radiation Shielding Frog Suit. Great music, too. Valigarmander wrote: [*] As stated before, I had trouble finding Mario-themed analogues for a few of the items. If I can, I'd like to replace the sprites for the Computer Area Map, the Light Amplification Visor, the Partial Invisibility, and maybe the Backpack and the Berserk, with things that are a bit more fitting. I think F.L.U.D.D might be a good backpack replacement. ^ N-spade or mushroom house for ammo? That is a great mod! I should probably customize the palette and/or colormap. A lot of the new textures are miscolored unless they're right up in your face. It was tomato sauce. He was making some pasta and then Mario scared him so much he spilled it everywhere. Any suggestions on what I should replace these with? Screenshots of retro Mario games? You know, that's the idea I had at first too. I might try that. Any thoughts on trying to make sprite resolutions more consistent/up rezzing? Stuff like the chomps would probably be easy to build just with vector tools. Totally fixed the palette, guys. BTW this is what Mario sees when he's got a starman.